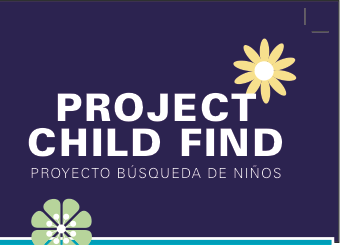 What is Project Child Find? Locate and identify children and youth ages birth through 21 with disabilities who are in need of special education and related services. Inform parents and/or guardians of the services available from their local school system and other state and community agencies. Children and youth who have been diagnosed or are suspected to have intellectual, physical, or emotional disabilities and are unable to benefit from a regular school program without special assistance. A referral to other agencies when needed. Lending support to the child and his/her parents/guardians until the referral is completed. A free appropriate public education is the right of every child with a disability, age 3 through 21. The law provides for early intervention services for children with a disability, birth through two years of age. Parents of children and youth with disabilities need your support and assistance. Your local school system and the Exceptional Children Division need your help in locating these children.